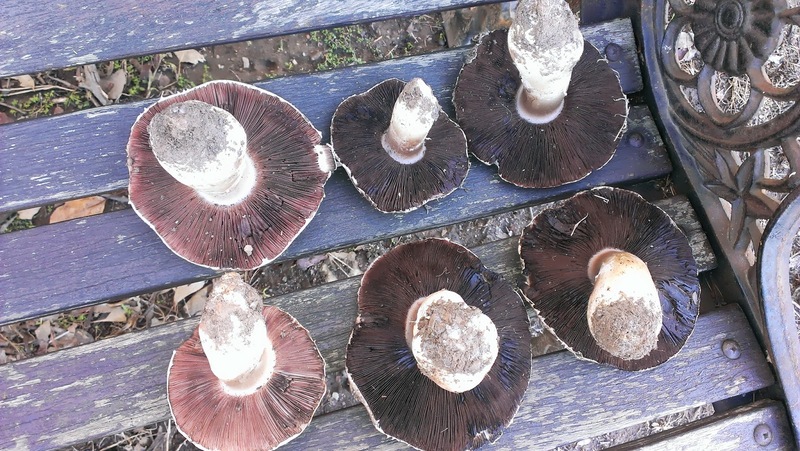 Glut: a year in my patch: Can I eat these? Please, please tell me, can I eat these? Does anyone know? In May and now in the very beginning of June we have had a fantastic amount of rain the creeks are all flowing and the dams are filling up. All this rain has been followed by beautifully clear and sunny wintery days. Rain + Sun = Mushrooms. These enormous examples were found growing in a grassy area near Callitris Pines (an Australian native pine). An area where cattle graze but similar ones can be found popping up all over the place round the property. These ones are probably past their prime as they seem to have attracted the attention of some insects but they look like ordinary mushrooms to me at least. 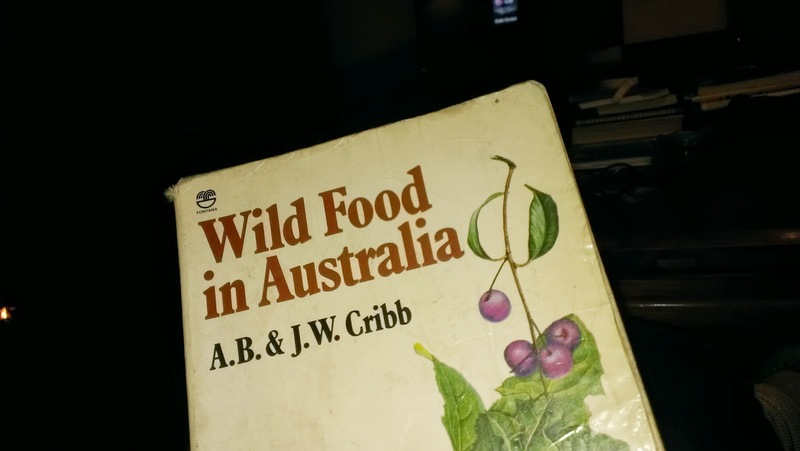 On consulting Cribb and Cribb's, Wild Food In Australia, they seem to match the description of Agaricus campestrus - the common Field Mushroom. 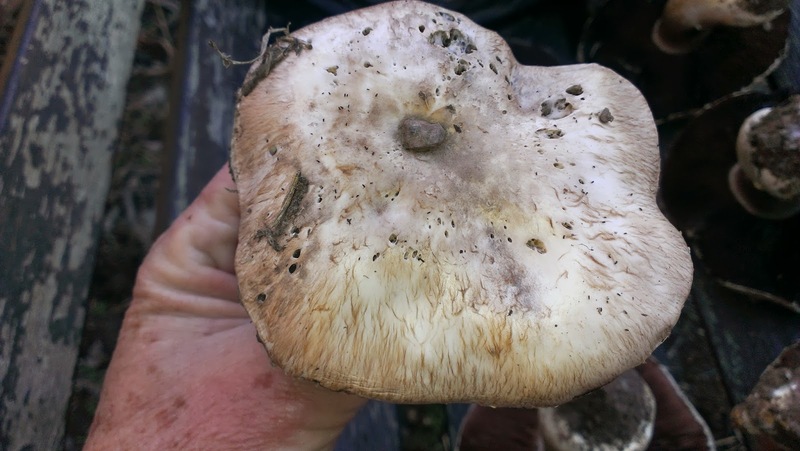 There must be someone out there who picks field mushrooms that can help? Can you easily identify wild mushrooms? When we were kids we used to pick ones that looked a lot like those and sell them by the side of the road. In retrospect its amazing anyone bought them but they did and I presume they didn't kill anyone... Having said that I couldn't be 100% that your mushrooms are the same as the ones in mum & dads paddock. Personally I'd ask a local - they must know which are good and which not are best avoided. Wild mushrooms are a tricky business. Mushrooms are hard to ID as lots of them look similar. 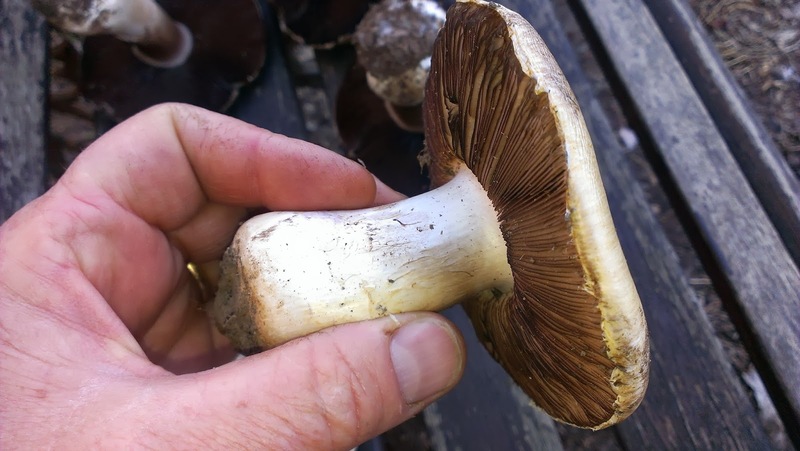 The general rule is that mushrooms with black spore prints are edible (but getting spore prints from fully developed mushrooms are unlikely) and that cooking mushrooms destroys any harmful toxins. But as with most rules there are exceptions. The one thing I learnt from mycology is that you should not eat wild mushrooms not unless you are 100% sure. The only mushrooms I know that you can eat with certainty are those produced by termites (Termitomyces spp. - apparently they are lovely). I am not sure whether this is a Field mushroom as the ring is missing and the problem is that Field mushrooms (Agaricus campestris) look very similar to the poisonous Yellow-staining mushroom (Agaricus xanthodermus). I second The Shroom and would be extremely cautious. I did a mycology seminar with this lady (http://www.alisonpouliot.com/projects_fungi_ecology.php) who was very knowledgeable on Australian species. Apparently in Aus there are over 10000 species of mushroom, whereas in Europe there are between 4-6000, and a lot of books are written from an European perspective which may not translate to our 'shrooms. I have had many yellow stainers come up in my garden and always can tell them as they go yellow at the base of the stem when you pick them and if you scratch at the side of the cap you also get the slight yellow and an antiseptic like smell. I have no idea what these are, but wouldn't be inclined to experiment. I'd ask around for a knowledgeable local. Thanks Liz, Shroom and Bek. You are right, I have not tried them, just so eager to know. I will ask around. I have some tiny botany knowledge, and knew about the yellow stainers. These haven't changed colour at all but take Bek's point about the stain perhaps being out of sight and I was confused at the lack of annular cap... More research needed. I concur with Liz. They look the large field mushys dad used bring home on from his travels (as a geologist wandering around cow paddocks surrounding Canberra).Generally they were from out in the paddocks (ie pasture) - dark gills (anything pinky pale coloured was suspect and avoided) and the skin is easy to peel off (I remember my mum saying to avoid any where you couldn't easy peel off the 'skin' from the cap and to avoid anything with yellow around the cap.) I am sure the locals will point you in the right direction.